With an annual rate of 4.0 percent, Niger has one of the highest population growth rates in West Africa. Driven by the rapid population growth and the increasing demand for food, agricultural expansion is the most dramatic change in Niger’s landscapes. Over the period 1975–2013, cultivated areas have increased from 12.6 percent in 1975 to 18.1 percent in 2000 and 24.5 percent in 2013. This represents a total increase of 94.2 percent. Agriculture expansion mostly occurred on the productive sandy soils of the valleys in the Tillaberi region, where cropland is now encroaching on traditional pastoral lands. On the surrounding plateaus and terraces of western Niger, a mosaic of steppe and short grass savanna dominates. The Zinder-Maradi region, already heavily cultivated in 1975, is now a wall-to-wall homogeneous agricultural landscape. However, agriculture is still expanding eastward on the remaining short grass Sahelian savannas of the Manga regions. In addition, an increase of 50 percent in irrigated agriculture was observed along the Niger River. Across the whole country, steppes remain the dominant land cover class and have remained more or less stable (about 45 percent of the mapped area). The more productive natural vegetation, however, suffered a sharp decline. The Sahelian short grass savanna (usually present on sandy soils) contracted in area by 26.7 percent from 1975 to 2013. 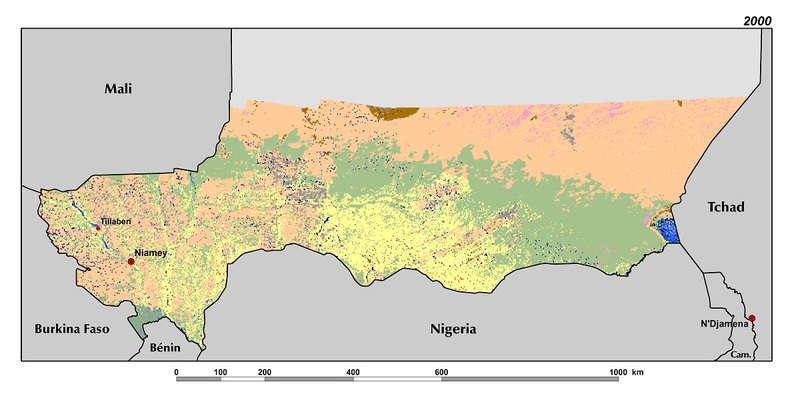 Gallery forests, representing the most dense and biologically diverse vegetation in Niger, have also significantly declined. Their total area has always been low (about 470 sq km in 1975) but significantly decreased (66 percent) in the 38-year period. Indeed, these forests mainly occupy the narrow valleys which are now heavily cultivated. Sandy areas have increased by 24.8 percent since 1975. This trend is a concern because it indicates a decrease in soil stability and a loss of vegetation cover in some areas of Niger. Moreover, the trend appears to have become more acute since 2000. This change occurs mainly in the Manga pastoral ecoregions (MA1 and MA2) characterized by ancient sand dunes stabilized by the natural Sahelian short grass savanna. During the drought years of the 1970s and 1980s, many of these dunes became active when vegetation cover was lost. In addition, wind erosion, overgrazing on low vegetation, and loss of woody cover from drought and deforestation, often result in land degradation and enhance the process of desertification. Mapping land use and land cover is an important part of the big picture of how land resources are changing. However, it characterizes an important dimension of land change that of land cover conversion from one type to another. Another type of change, often more subtle but equally important, is a change in the quality of the land cover, often called land cover modification. 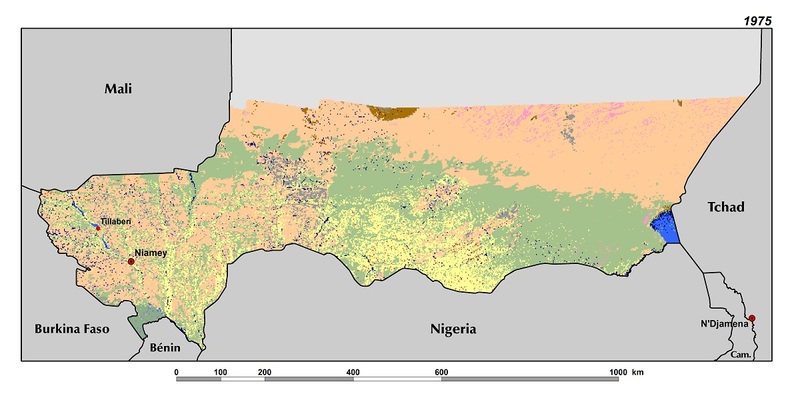 There are major examples of land cover modification in Niger. In the short grass savannas, there has been much loss of shrub and tree cover following drought periods and from cutting trees for firewood. On the positive side, Niger is the home of one of West Africa’s most significant success stories — the regreening of its agricultural lands by hundreds of thousands of farmers who have adopted an agroforestry practice that increases and maintains on-farm tree cover. This is a major development in land cover modification.